Cholesterol is a thick, lard like substance that you get from food sources. Cholesterol is also made in your liver. A diet high in processed foods, animal protein and full fat diary causes your liver to produce more cholesterol. Excess levels of cholesterol can cause a hardening of your arteries and a build up of plaque in your arteries which can cause a blockage. That blockage can cause a heart attack or stroke! Cholesterol is affected by age, gender, family history and diet. You can't change some of your risk factors, so you have to change the ones you can. This means diet and exercise. Elevated cholesterol increases your risk of heart disease and stroke. If you have other risk factors as well, like obesity, hypertension, diabetes or cigarette smoking, your risk is even greater. So how is hyperlipidemia treated? Lifestyle management is the key to lowering cholesterol. Supplements that can lower cholesterol include Niacin which lowers triglycerides and Omega 3s which increase HDLs. People also use red yeast rice, garlic, and cinnamon to lower their cholesterol. Hyperlipidemia, or high cholesterol, essentially means that you have too much fat in your blood. These fats clump together with red blood cells to cause clots and blockages in your arteries. There are 3 types of cholesterol in your blood that we measure when you get a cholesterol test: high density lipoprotein (HDL), low density lipoprotein (LDL) and triglycerides. HDL is the "good cholesterol". We want the number to be above 50 mg/dl. HDL helps prevent heart disease and stroke and slows the development of plaques in your arteries by removing LDL from the bloodstream and pushing it back towards the liver to be processed and removed. HDL is generally low in patients with diabetes, obesity, smokers and those that lead a sedentary lifestyle. Low HDL can also be genetic. LDL is considered the "bad cholesterol". We would like your number to be less than 130 mg/dl, with less than 100 mg/dl being optimal. An elevated LDL can lead to plaque build up and blockages in blood vessels in your heart, brain and legs. These blockages can cause a heart attack, stroke or peripheral artery disease. Diets high in saturated and trans fats increase LDL levels. Triglycerides are a type of fat in your blood that your body uses for energy. We want triglyceride levels to be less than 150 mg/dl. 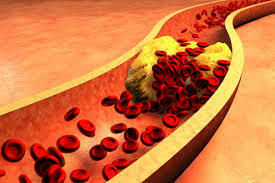 Elevated levels of triglycerides can cause a hardening of the arteries called atherosclerosis. Elevated triglycerides can be genetic, but are also caused by obesity, inactivity, cigarette smoking, excess alcohol consumption and a high carbohydrate diet. The latest data on heart health indicates that sugar, not fat causes heart disease. While it is true that sugar causes widespread inflammation in the body, we know that trans fats and many saturated fats contribute to heart disease as well. Our current recommendation is to avoid trans fats and limit saturated fats. Here's a delicious, heart healthy recipe for you to try. Heat 2 teaspoons oil in a large nonstick skillet over medium-high heat. Sprinkle 1/2 teaspoon salt, 1/4 teaspoon pepper, and thyme evenly over chicken. Add chicken to pan; cook 4 minutes on each side or until done. Remove from pan; cover and keep warm. Heat remaining 1 teaspoon oil in pan. Add onion to pan; sauté 2 minutes until tender. Add garlic to pan; sauté 30 seconds. Add fruit and remaining ingredients to pan; cook 5 minutes or until liquid almost evaporates.